Point Purchasing is competitively priced for the mid to small market. The price is based on the number of users in your company. We also offer a "starter" package for small companies. For more information on pricing please call (866) POINT-68 or Request Information! 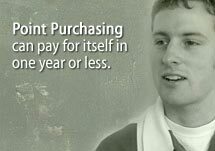 Fill out the form below to see how much you can save by using Point Purchasing instead of your paper-based system. The figures were based on feedback received from current Point Purchasing buyers. Savings in minutes by processing an order with Point Purchasing versus a paper-based system. Requisition authorized online via automated emails. System automatically assigns PO number. Ability to combine requisitions to a single PO. PO sent to supplier as integrated order. Receive an entire PO with just 2 clicks. Efficiently handle returns, over/under shipments. Search incomplete items as well as "items due today". Point Purchasing EZ Integrator imports data seamlessly into accounting application, reducing data input errors and redundant keying of data. Number of requisitions processed on average in one business day. Point Purchasing can pay for itself in one year or less. CONTACT US and we'll show you how.